Bring the beauty of nature into your home by choosing a granite countertop for your kitchen or bathroom. By choosing a granite work top you give your home timeless performance and beauty, that will increase the value of your home while adding a unique finishing touch to your home's design. Next to diamonds, granite is the hardest stone in the world. It is durable, waterproof, stain resistant, heat resistant and virtually impossible to scratch, making it and excellent choice for a work top. Unlike man made products, granite is a natural product with a unique beauty that is impossible for man to re-create. Granite is available in a wide variety of colors and textures ranging from subtle to exotic. Granite is quarried all over the world with each quarry containing a different color. No two pieces of granite will ever be the same so you can be assured of having a one-of-a-kind countertop. Many people rule out granite as a countertop material because of the common misconception that it is more expensive than other solid surface countertops. However, this is not the case. 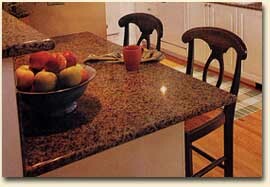 Granite and solid surfacing are very comparable in price; granite often being less expensive. Many factors such as availability, quarry location, slab thickness, and edge detail can determine the cost of granite. 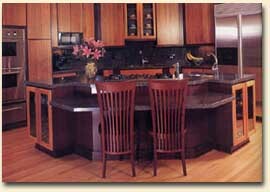 Send us a plan of your kitchen and we can give you a free estimate.